Hmm, the weather is not always as we hope it would be when we plan our work on the plot. We are getting to know the struggles farmers and food growers all over the world face when they need to dance to an uncertain rhythm with the changing weather bound to change even more. Our problem is much smaller than theirs as what we grow on the plot does not determine the success of our business or survival but it does translate into enforced changes to our work patterns. Instead we mused what are our feelings and ambitions for the next month to keep the vision and ourselves going. Adriana’s words echo the core teams feelings I think as we all longed to have a dig of sorts, to get to work on a physical structure while we were doing the design. We had to be patient as work and life meant we could not always meet up or Skype chat weekly but we were steadily chopping away at this piece of work we set ourselves slowly realising the actual shape. To keep your vision alive as well see this design Sketch to which we are loosely working to. The measurements have changed for some of the objects already as we decided to align the shed West-East with the door towards West and to move it out a meter to allow for some storage space behind it. This means the triangular beds will be shorter. As I have learnt at the Permaculture Design Course two years ago “The map is not the territory” so we are keeping flexible with the design but we have spent much time on the design process to “Make mistakes on paper” rather than in real life. Looking back at what we have achieved so far we have a close-knit core team, we have regular meetings and calls in place, design of the plot, shed set up, soil covered up to prevent weeds from growing and support from the community expressed at Southend Soup. I have calculated that since starting thinking about the project in 2012, through initial conversations to first workdays and meetings we must have put in a minimum of 300hrs, over 36 normal working days, over 7 (5 day working) weeks. 300hrs is a very, very conservative number in itself and I have not even tried to count the time we spent thinking, dreaming, talking about the plot as this would probably multiply the 300hrs. Lets pop a champagne cork to celebrate:) I bow to you my friends and colleagues. If you want to see what comes out of this effort follow the blog or Facebook Page and pop down for a cup of tea and cake on the open days. Next work day is on the 26/10 from 11 until 14. Let me know if you are planning to come so I can update you should plans change. Let us help you manifest your passions. Oh wow what a weather this Sunday. Rain and rain, was anyone flooded this time? Luckily we have used the Saturday the day before well and and after a successful Apple Day with the help of Duncan and Leyla took the chairs and tables donated by Growing Together folk to the plot. The shed on inspection looked dry inside so we have done a good job last week with putting on the felt and the weed control fabric is suppressing the weed uprising. We got a bench and table donated kindly by Alicja which will be a nice feature on the plot. Hmm seems like we are doing and getting everything to keep dry and warm and have a place to sit and the digging moves on later and later but hey this plot is not about starting a second job and doing overtime. It is supposed to help create social glue in our group and wider community through gentle work and leisure so I think we are doing the right thing. The Apple Day conversations and the apples we scrumped from an apple tree next to the allotments brought up conversations again about using the abundance of fruit in Southend. Hopefully in the future there will be people interested to drive forward a Scrumping project, at the moment our group is focusing on one thing at a time… but if you wanted to start something up let us know and we will help you get in touch with other people. Add your fallen fruits here. You can join us for the next work day 20/10 Sunday 11-14, although the weather forecast is not favourable at the moment it might change as it did last week so if you plan to come to the plot text me and I will update you on the day. If it is raining we will meet up indoors (to be decided where) to do some design/planning work. Skype call 16/10 at 8:30 for the core group. Thanks to Duncan, Leyla and Growing Together this week for their work and donations. PS. Oh yes, Leyla is a new member of our core group, meet the white VW camper with her trailer. What a lovely day it was! We could not believe it was October it was so warm. Duncan, Adriana, myself and Ross got to work on the shed’s roof and felt, the latter one purchased from the donations from Southend Soup. Now we did not need the roof today but well into Autumn and Winter when we visit the plot and the weather decides to treat us to some rain we will have a dry place to hide away for a cup of tea. Last week felt like a historic moment for our plot as we put up the shed. 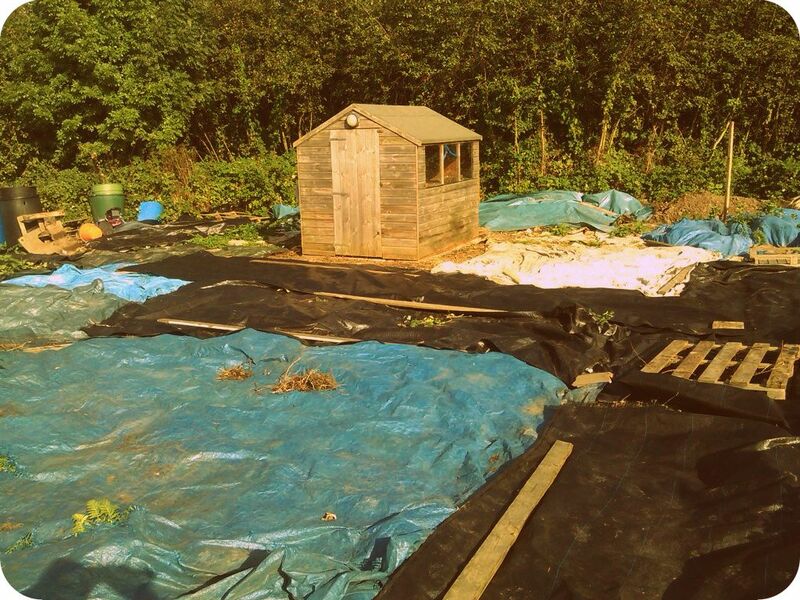 After months of design work and keeping the weeds at bay with a quilt of the weed control fabric, tarps and whatever else we could fish out from skips and our backgardens one can actually believe now that we are going to be doing something worthwhile with the plot. Dave from the SEAGS was probably wondering when to let us know that he needs to let the plot to someone who will actually grow something on it:) but now we can crack on to measure out the paths and beds and start digging. Not sure how much we will get to plant this season but while doing the weeding we can do some foraging so there will be a yield for sure. Having so many helping hands made the work easy and fun and each of us drifted to the work which was right for them. Bosco popped in for a chat and Fiona was in touch saying she wants to join in so we had another example of how Southend Soup keeps on giving. Let me know if you want to be kept up to date with our work days, send me your email or text and do not worry if you cannot come here and there. We as the core of the group will keep on coming and you can fly in when you want and can, no stress. The plot starts to take shape in the material world but I could also witness the seed of the invisible yields which it is even more about than just plain old growing food. Like minded people connecting through work, new friendships forged, business ideas to change the worlds exchanged, warm words of support and practical help offered for people to develop their passions. And all that in an afternoon on a plot where no seed was planted yet. As Graham said “Permaculture is revolution disguised as organic gardening”. I am looking forward to the months to come. Next work day coming this Sunday from 11:00 and we are having a Skype talk this Wed from 20:30. Might see you at the Apple Day on Saturday beforehand. Please bring work boots, a spade or fork if you have one, gloves, food, drinks, twine, rope or bunting as we are going to be measuring the paths and beds out. Such fun. Ok, Skype talk finished. Sorry to hear Ian work is enslaving you so much:( but here is the plan we have made. -celebrate success of Southend Soup – master baker DS to bring a cake, KP as usual tea and coffee, others bring goodies along as well to nourish our bodies and souls. Ross I have seen you have been able to view the docs, they might not make much sense initially but hopefully you made out what is what. Ross and Bosco, feel free to join in the work day. I have set up the blog for the plot at https://sitcommunityallotment.wordpress.com/ and connected it with the Facebook Page we will later on play with the template, pics and contents. And OMG Big Brother has done up to date satellite pictures of our plot http://goo.gl/JrW0qd with the covers on.